Good lord, Bill, are you actually encouraging ‘The Donald’ to start strutting around bare-torsoed?? (“Bear-torsoed”? No, it wasn’t an attempted pun!) What if his chest hair is just as absurd as that stuff on top of his head?!? The mind reels!! I guess the snarling belligerence of what GOP considers “American values” points to Ben Carson as ideal Commander-in-Chief. This guy’s ready to singlehandedly tackle crazed gunmen on college campuses and ride a time machine back to Nazi Germany to personally lead armed resistance to overthrow Hitler’s regime!! Good thing he retired from Neurosurgery. I’m not sure I’d want his hand on the scalpel as it hones in on MY noggin!! Allowing for a possible misunderstanding of the article’s context on my part, I have to say that associating Russian president Vladimir Putin with America’s reactionary Republican Party constitutes a gratuitous insult to both Russia and its president, currently among the world’s most competent statesmen. It constantly amazes me why many Americans feel the need to bad mouth Russia and its political leadership. Either these people come across as bumbling objects of contempt, like the drunken Boris Yeltsin — virtually a U.S. puppet — or as some sort of sinister Svengali like Vladimir Putin, a former KGB “thug,” unlike, one supposes, former U.S. President George H. W. Bush who headed the saintly C.I.A. The rank hypocrisy and narcissism manifest in American attitudes towards Russia and the rest of the world virtually demands a smackdown of epic proportions, and with the ludicrous clown car of another U.S. presidential election now upon us, it only remains for fate to determine who will administer the bitter medicine — some combination of Russia, China, and Iran, or the pathological, bungling Americans themselves. 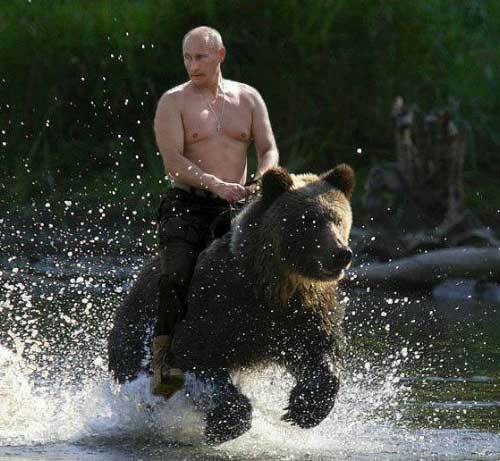 And as for the Photoshopped image of the bare-chested Vladimir Putin riding a bear, I can still recall the admiring photos of the “husky” Kennedy brothers, Jack and Bobby, playing touch football on the lawn at Cape Cod, or pictures of Barack Obama body surfing in Hawaii. How formidable and “manly”! No wonder that so much of the civilized world looks upon America as the land of infantile Hollywood fantasies taken seriously by the gullible theater audience. As my older son said to me the other day, the U.S. should issue Vladimir Putin an H1-B visa so he could take President Obama’s job, since America no longer produces its own sensible and competent political leadership. The U.S. has either Donald Trump or You-Know-Her. The Russians have Vladimir Putin and Sergey Lavrov. Game, set, and match to Russia. And a good thing, too. Well put, Mike. No insult intended toward Putin. It just seems to me that if Republicans want a leader to prosecute an aggressive and muscular foreign policy, Putin just might be their man. Actually, it seems to me that many Americans have Daddy issues. Please, please, they seem to say, give me a tough leader with muscles, someone to protect me and keep me safe, someone I can look up to. The lean metrosexual and coolly rational Obama, chewing his way through arugula, is decidedly not their man. But a man like Putin? Definitely. Now that I think of it, Trump’s big appeal to many Americans is his bullying nature. His so-called toughness. His “aggressiveness” in debating. It’s something Tom Tomorrow captures in his comic strips when he has Republicans fawning over a cave man who promises to bludgeon the enemy. But if Trump is America’s “tough” leader figure — well, our days are well and truly over. Clown car, indeed. Perfectly said Mr. Murray. Obama and Putin each recently addressed the U.N. Compare and contrast and see who comes across as reasonable and attached to reality. Maybe it’s better to say that the way Putin is portrayed and perceived through major U.S. media and the U.S. government is an image of the sort of candidate the G.O.P. dreams of. He’s far (far!) from being the head of state I would find ideal but he certainly seems to be sane, rational and reasonably intelligent. He also apparently lives in the real world rather than the cloudcuckooland the Washington elite inhabit let alone the exceptionally deep level of insanity that the current Republican party has delved to. Good show Michael.. For anyone who is not suffused with the State Dept. and the Pentagon’s self serving propaganda it is clear that Putin is the master chess player. Putin sees this mess clearly as a play by the Saudi Sunnis and their Gulf state acolytes, supported by the US, to break the Iran Shia axis thru Iraq. His strategy is to secure the Assad government long enough to put ISIL on the run and than replace Assad with some kind of sectarian ( as opposed to Sunni Wahabi) semi democratic government which will protect Russia’s interests in their own Latakia naval base. This is no threat to the US or to Western Europe. Game, set, match. If Obama and the entire US foreign policy bureaucracy was not stuck with defending Saudi-Israeli interests over our own interests they would have long ago been able to thwart the rise of the murderous Islamic Caliphate by working out a deal with the Russians.on Syria. The sophomoric nature of our foreign policy in that area is highlighted by our naivete in the multi million dollar failure of our attempt to arm and train Syrian so called “moderates” which we are now replacing with arming the Kurds. At the same time we have given Turkey the go ahead to attack the Kurds in repayment for allowing us to base our attack planes at their Incerelik air field. Such monumental stupidity!